Ruin Flippers! From Medieval to MAGNIFICENT! 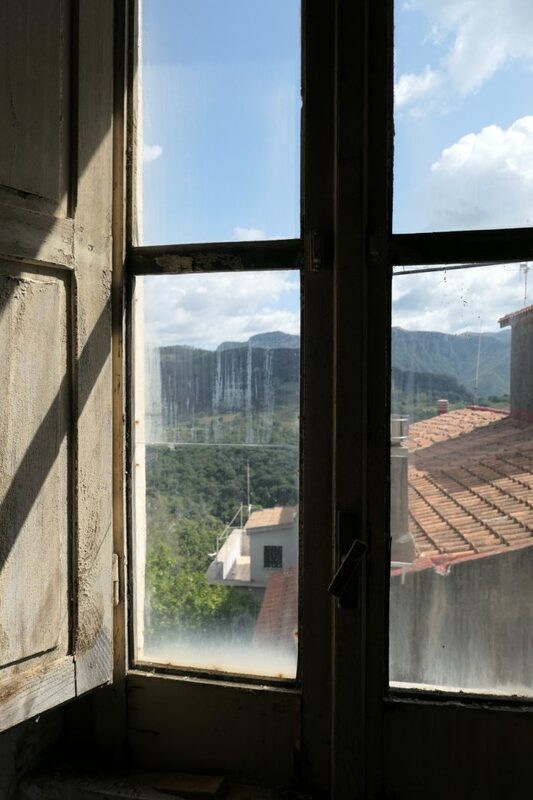 I have been in Santa Domenica Talao all week and if you have been following me on Facebook and Youtube, you know I have been up to some really fun and cool things and I am designating a portion of this blog “Ruin Flippers”. To start off with, I have been working with our village architect and contractor on renovations for the house my husband and I purchased in 2011. When we bought our place here in Santa Domenica, it was a good sized apartment but we needed more bedrooms. 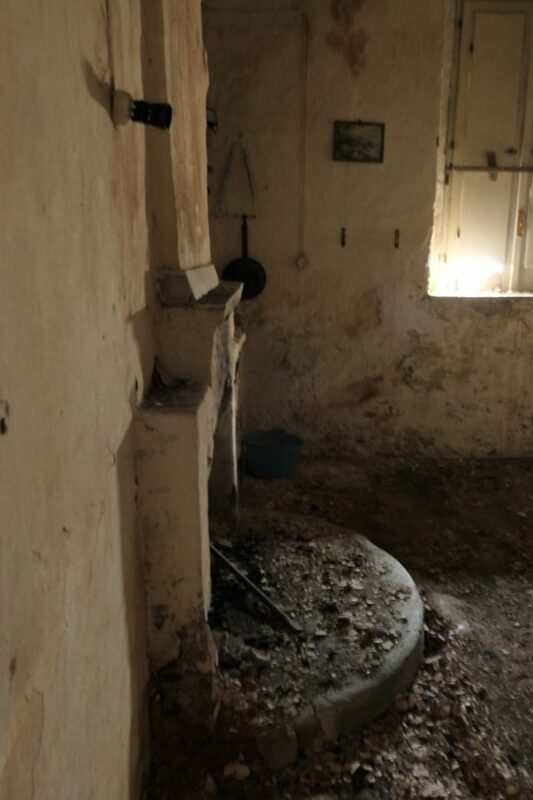 So we purchased the ruin that is attached to our place with the idea that one day we would fix it up. Initially we were thinking of making the ruin into a separate apartment but then we decided that it would be much more practical if we opened up the wall between our living room and the ruin and expanded our current living space. This gives us an open plan living area and a new kitchen while freeing up the existing kitchen to be a good sized bedroom. Ultimately we will have two more bedrooms, another bathroom and another balcony with sweeping views of the sea. Soooo I met with Antonello the architect and one thing led to another. In the end we are getting a roof terrace as well and another storage and laundry room up top. For a better picture of how this will roll out, please see my Youtube video as I walk you through the house and explain the changes. 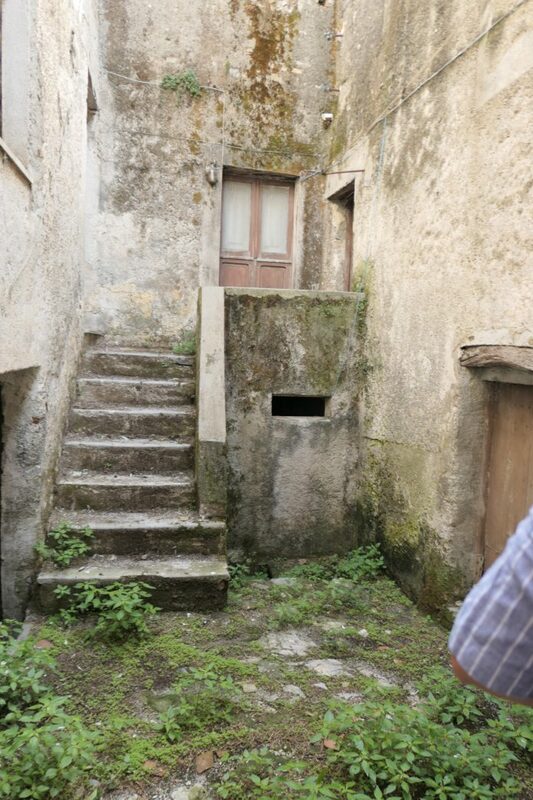 Knowing that we are renovating our house, Antonello, the village architect and incredibly smart historian insisted that I see the inside of the massive ruined palace that sits at the top of the village overlooking what used to be the original piazza. Our village is actually upside down from what it used to be. The old piazza used to be at the top back of the village and overlooked the mountains. The newer one is in the front and overlooks the Mediterranean. In its heyday, the ruined palace overlooked the piazza and the little alleyway that ran down from the upper piazza to the church. The alleyway was filled with shops and stalls all the way down and as you walk down from the top today following it, you can see how it might have looked. The front door of this ruin is actually located on the opposite side from the road leading up to it and half way down a little alleyway. The palace is a block long, multiple levels and God knows how many square meters. The entry way with the beautiful terrazzo floors. Going up the from steps, the front door opened into a large entryway with a huge hallway/living space beyond it. And as you walk in, you step back in time to the late 1890’s when this palace was in its original grandeur. 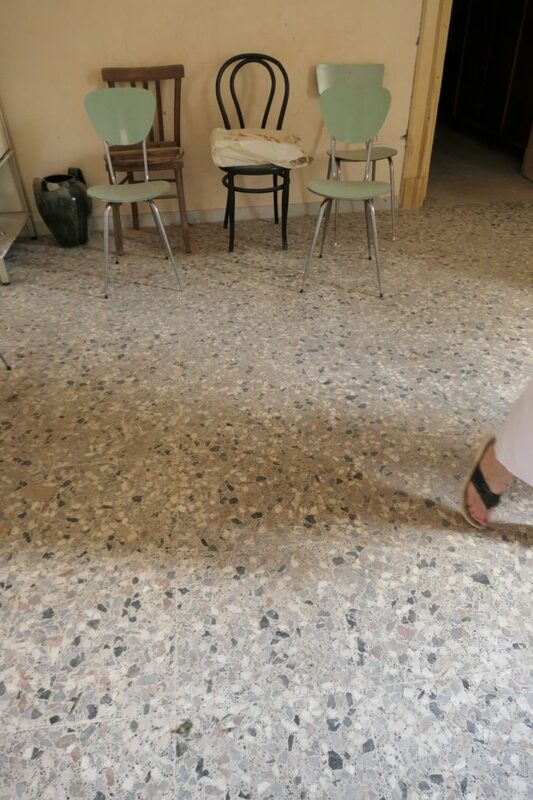 For now, the beautiful terrazzo floors are covered with dust. 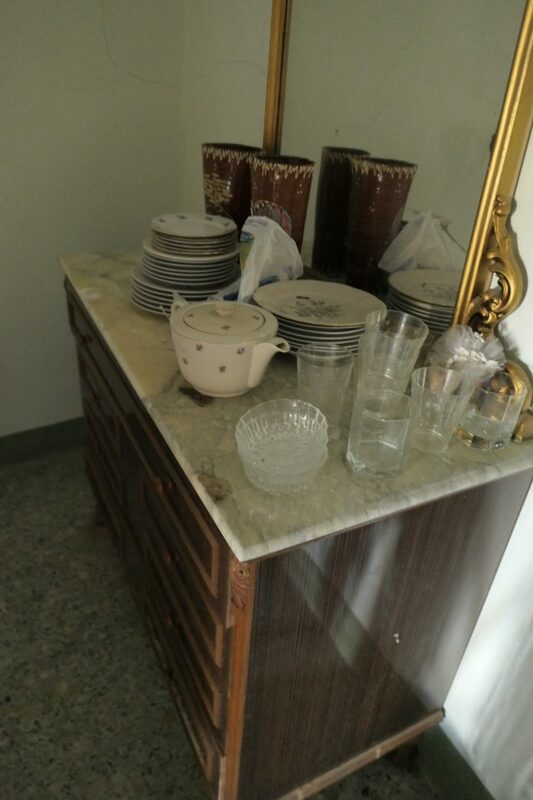 The original furniture remains along with the teapots and dishes. 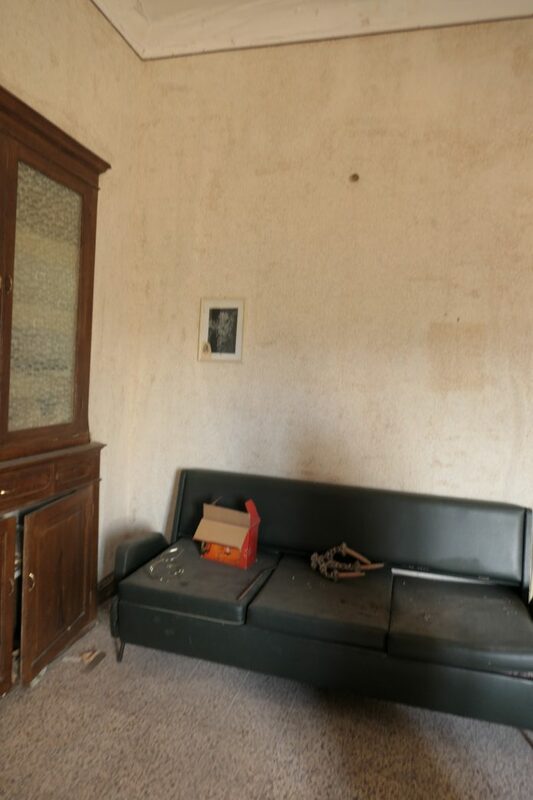 A sofa that was new in the 1950;s looks oddly out of place next to the walls that have been standing since the medieval period. As you walk through the grand hall to the front of the house, you enter a huge drawing room big enough to be a ball room. A little TLC and she could be as grand as she once was. 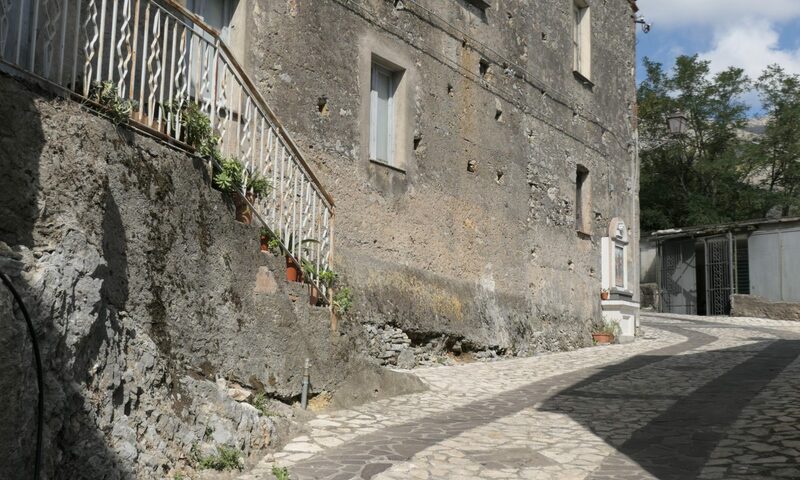 In front are two large balconies overlooking what used to the the main piazza and the center point of the village. 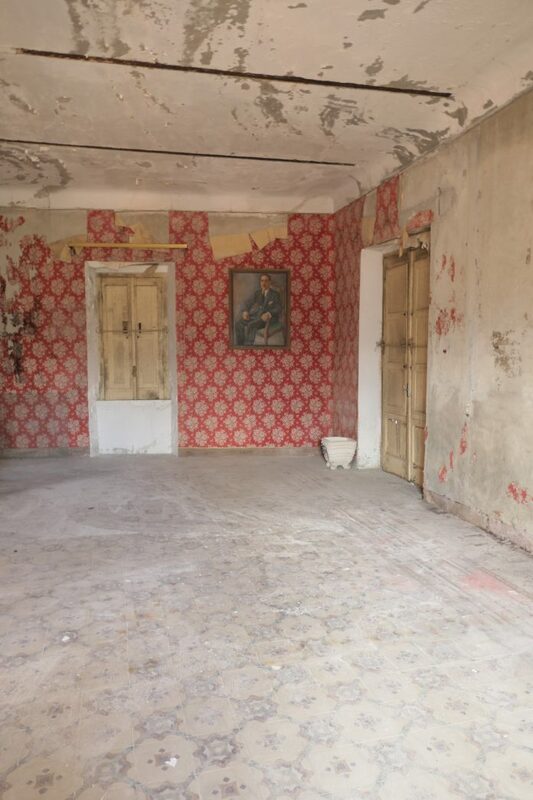 The walls are covered with bright red wallpaper which, upon close inspection of the newspaper backing it, reveals a date of 1960’s when the wall paper was added to dress up the space. The floors however were the most beautiful part of this huge room. 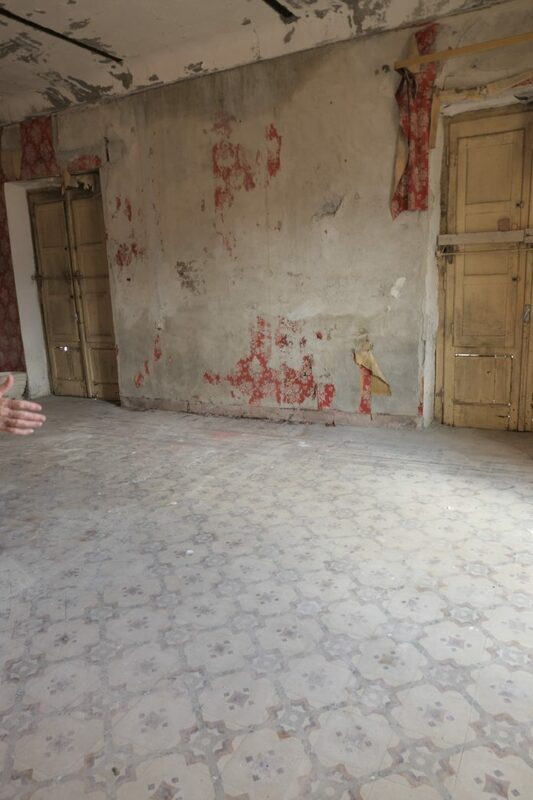 Again covered with decades of dust, the tile floor is a complex pattern of painted tiled put together to look like a fine carpet. 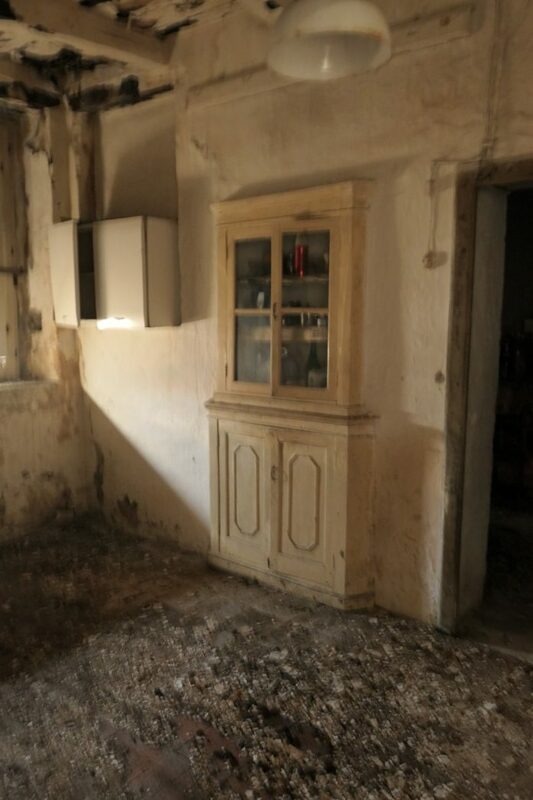 Although the floor is covered with dust, you can look at the walls, the furniture left in the other rooms, the chandelier that has been promised to the church in the new piazza, and see exactly what this room once looked like. It was grand and beautiful. As Antonello took us on a walking tour through the house he pointed out pictures on the wall. One picture was a daughter of the owner. 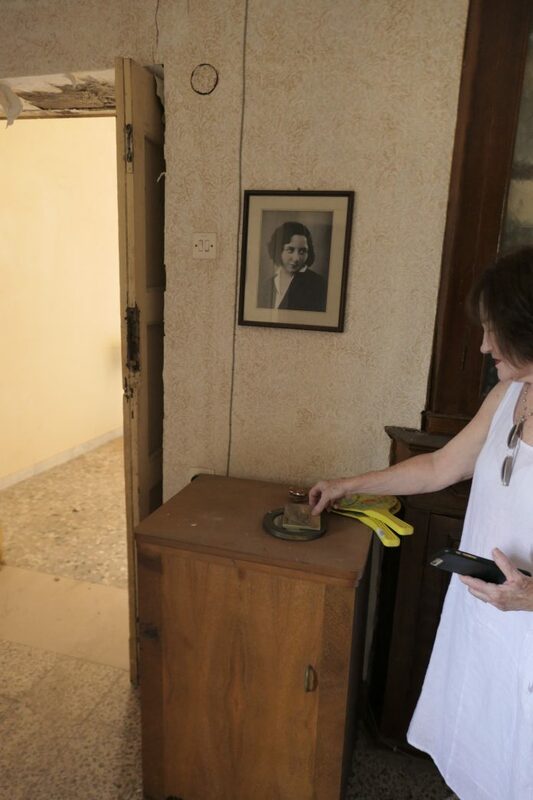 Antonello told us her sad history and her photo shows a sadness that is frozen in time here on a wall in the corner of the hallway. As we made our way through, more photos were revealed, again frozen in time and miraculously still attached to the walls waiting for someone to collect them. 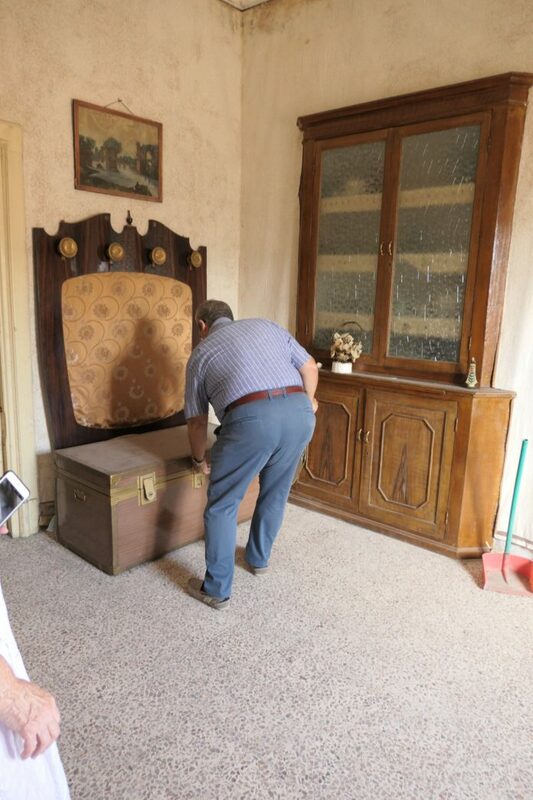 According to Antonello, the owners of the house want to sell it and sell it for cheap. They understand the amount of work it would take to repair and restore this beauty and it is a labor of love that Antonello showed it to me in the hopes that I might help him find the perfect someone who wants to restore a beautiful place in the a perfect little hill town in Santa Domenica Talao, Italy and live there. This place would make a stunningly beautiful home for someone who wants to live in a place where life is piano, piano, love and community are still important and where food, art, architecture and beauty reign supreme. If you are that special person, please contact me. The asking price is peanuts and I know the local builder. Antonello would love to set his considerable talents to work redesigning the spaces so that they work for a modern lifestyle. 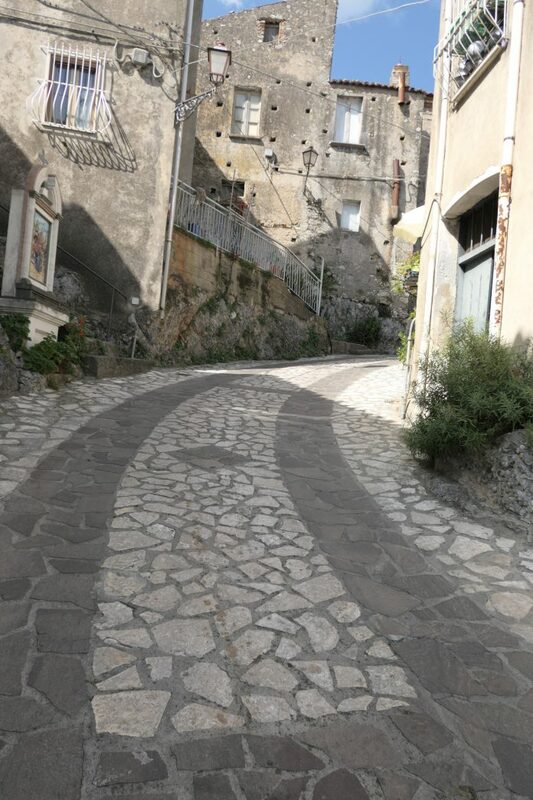 In the end you could own a palace that takes up an entire block at the top of a stunningly beautiful village in Calabria for less than you would pay for a crappy condo in San Jose, California. 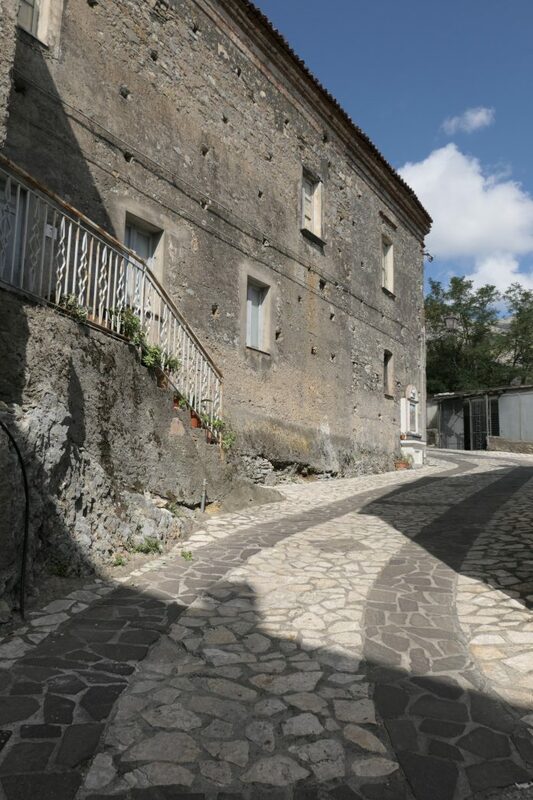 And if you want to join the ranks of Ruin Flippers, you could live here in Santa Domenica Talao, in the most beautiful village in the world. For detailed video descriptions of the village and the ruin click here and here. If ruins do not appeal to you, there are renovated properties available that are so cheap you could almost put them on a credit card. . They are very affordable and have magnificent views of mountains or the sea. It is a buyer’a market right now so a great time to buy. For advice on moving to Italy, please check out my interview with Bonnie Gale Oliver. She gives you a glimpse of life in the village and valuable advice on how to make the move. And stay tuned for detailed pictures and videos of our own renovation projects. We are renovating our house and eyeing a property that would make fabulous BNB. We are ironing out the details right now but we will soon be in full swing. 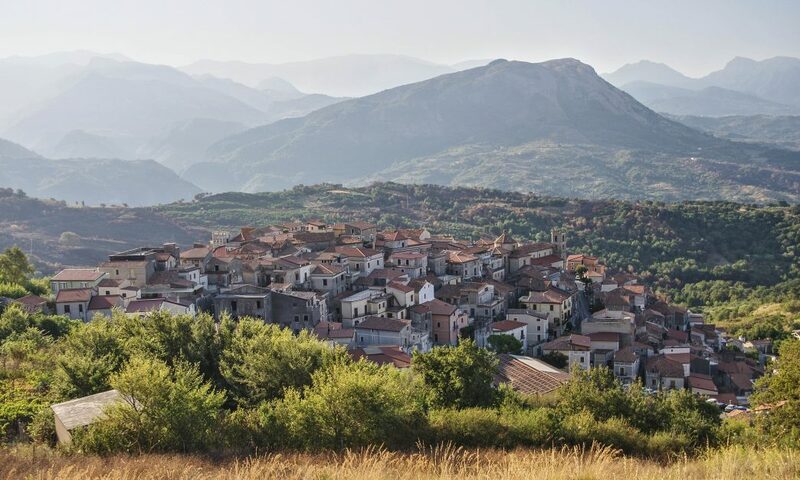 PS for more photos and reasons to chuck your life and move to Italy, check out my blog post on why Calabria is such a great retirement destination. Previous PostPrevious Interview with an Expat: Can You Move to Italy?